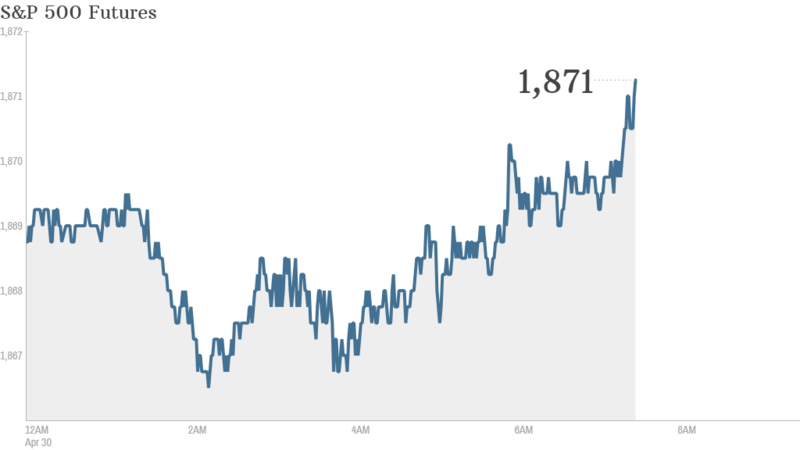 After wading through a flood of earnings over the past few weeks, investors are turning their focus back to the Federal Reserve and the economy on the last day of the month. U.S. stock futures were weak but little changed ahead of the opening bell. The Fed wraps up a two-day policy meeting with a decision on interest rates at 2 p.m. ET. The central bank is expected to reduce its asset purchases by another $10 billion. Tom Elliott, investment strategist for deVere Group in London, said there's "a general amount of uncertainty ahead of the Fed, which is extremely normal." Employment and economic growth is also on the agenda: Payroll processor ADP will release its monthly report on private sector hiring at 8:15 a.m ET. Investors will also get their first look at how the economy fared in the first three months of the year when the Bureau of Economic Analysis releases its initial estimate of first quarter U.S. GDP at 8:30 a.m. ET. According to FactSet, the economy is expected to show a 1% annual growth, sharply below the 2.6% growth in the fourth quarter. "U.S. GDP is expected to show a dramatic slowdown from 2013, but to some extent this news is already baked into current market activity," wrote Chris Beauchamp, market analyst for IG in London. "The key will be the Fed statement, which is expected to underline the FOMC's view that the economy still needs careful nursing to reach full health." "A lot of attention will be on Twitter, too, in the wake of its disappointing results," he added. Shares of Twitter (TWTR) sank 12% in premarket trading after the company posted uninspiring first quarter results. But Energizer (ENR) shares jumped 9% after the battery company announced plans to split into two companies, Household Products and Personal Care. In other corporate news, CNNMoney parent Time Warner (TWC) reported earnings and sales that topped forecasts, helped by strong revenue from the Lego movie. Shares of Royal Dutch Shell (RDSA) rose after the oil giant reported better-than-expected quarterly results and hiked its dividend. eBay (EBAY) shares declined a day after the online marketplace reported disappointing earnings. Yelp (YELP) is reporting after the bell. The latest merger deal: Exelon (EXC) agreed to acquire Pepco Holdings (POM) in a $6.8 billion all-cash deal. Takeover talk continues overseas, with shares of French company Alstom (ALSMY) rallying 8% in Europe after General Electric (GE) bid $13.5 billion to take over the firm's power divisions. German firm Siemens (SI) may yet make a counter offer. U.S. stocks closed higher Tuesday, with the Dow logging its fourth-highest close ever. Over the course of April, the Nasdaq has declined by just over 2%. The S&P and Dow have eked out minor gains. European markets were mixed in morning trading. Asian markets ended with mixed results.